I seem to have pretty good luck finding these things on eBay lately, and at great prices too. This is another one that cost me just $0.99 plus a few bucks for shipping. Not bad considering the top loader it came in was marked for $10. I guess there were no takers for that price. As you can see, this one features former Coyotes goaltender David Leneveu. Of the five of these I have, the others being Howard, Vanek, Carter, and Suter, Lenevue was the least successful in terms of playing time in the NHL. The other four are all regulars in their respective team lineups to this day. Leneveu managed to play 21 games with the Coyotes and just one with Columbus through the 2011-12 season. This one brings me to a total of four for the set project, as I'm not going to double count the Howard in both my player collection and the set collection. I still need to get another one to complete the set. Who knows, maybe I'll get lucky and come across one for cheap at the card show tomorrow. As far as what I'm looking for this time around, I definitely will be hitting all of the dime, quarter, and dollar boxes I can find to help out some of my set projects. You never know what you will find in those things, you just have to look. I'm also hoping now that the hockey season is over, some of the non-Red Wings stuff will be a bit cheaper with the focus being more on baseball at the moment. I don't think I will be going for any packs of boxes unless I find a deal I cannot pass up. While I did get some stuff in the mail today, it was for one of my non-card memorabilia collections, so I will have to settle for getting another one of these pack breaks out of the way. Today we have one pack of 2006-07 MVP, one of my least favorite of the MVP designs, and one that I've busted a few packs of before. 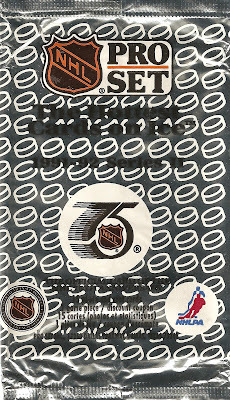 As you can see from the scan of the wrapper above, there were eight cards in this pack with one insert or rookie card in each one. 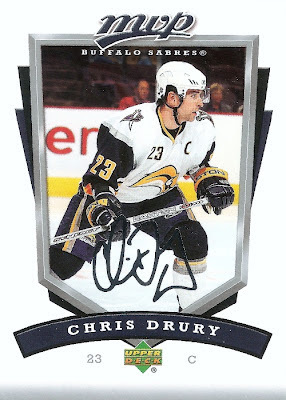 While I did get one insert, let's start off the base cards first with this one featuring Chris Drury of the Buffalo Sabres. 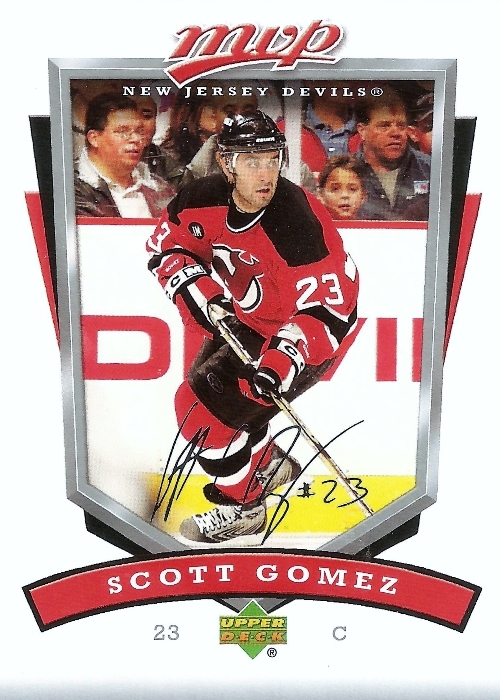 Card number two was this one featuring Scott Gomez of the New Jersey Devils. 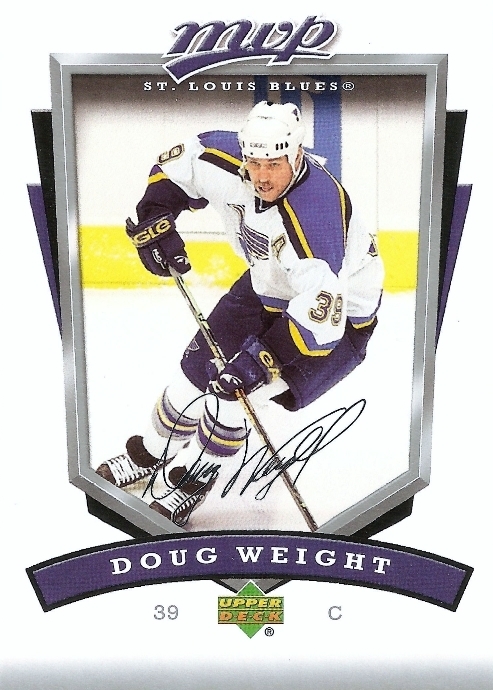 Then there was this one featuring Doug Weight of the St. Louis Blues. 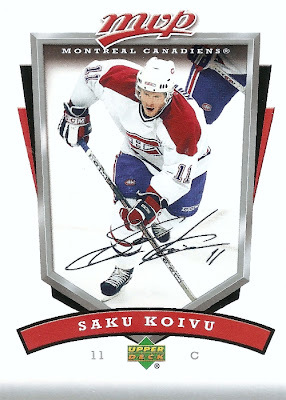 Followed by this one featuring Saku Koivu of the Montreal Canadiens. 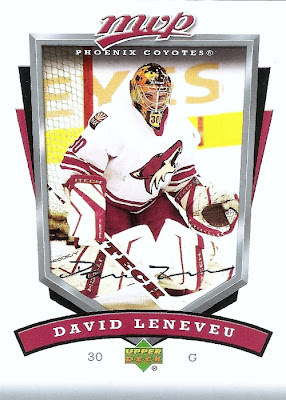 Next was this one featuring David Leneveu of the Phoenix Coyotes. 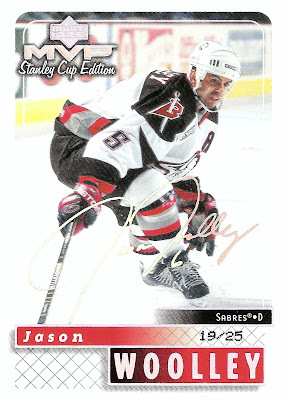 The last of the base cards was this one of Marek Zidlicky of the Nashville Predators. 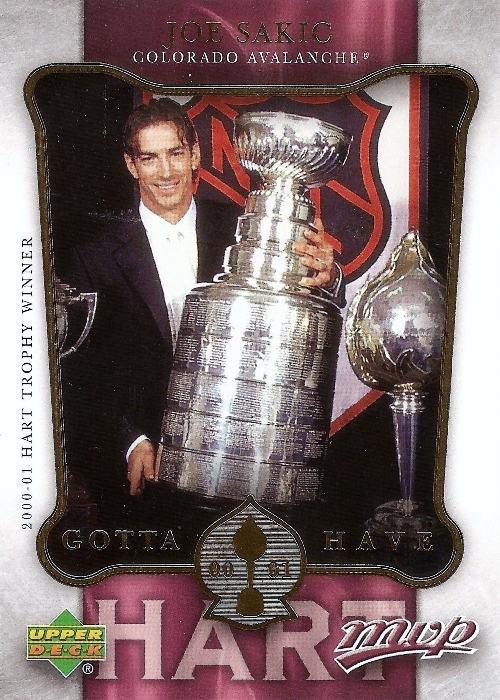 Finally, the one insert I managed to pull was a "Gotta Have Hart" featuring former Avalanche and recent HHOF inductee Joe Sakic. So, definitely not the most exciting pack in the world, but it could've been worse. I guess part of the problem is the design. I think ever since the MVP set changed to the more script-looking text, the designs were never the same. Since I don't have anything else to write about until my latest eBay purchase and trade pickups arrive, I thought I would share another one of the twelve packs from the Target value box. 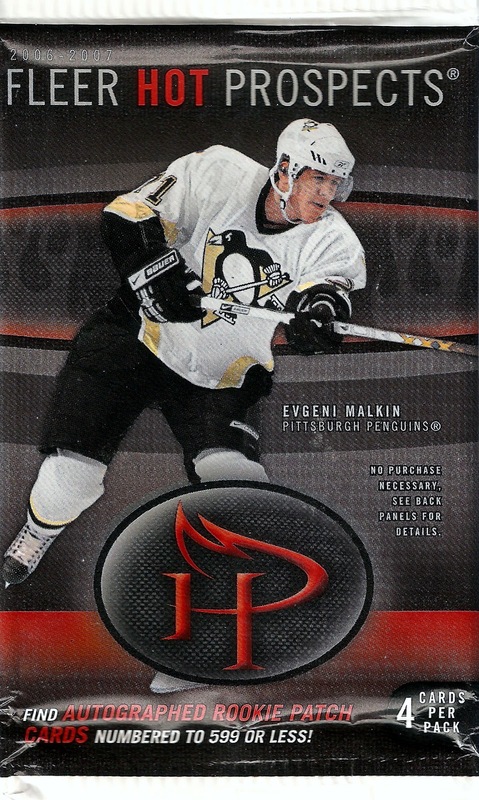 Today we have a pack of 2006-07 Hot Prospects, a product that I don't ever remember opening before. The wrapper says "find autographed rookie patch cards numbered to 599 or less" but we all know that will never happen coming from a retail pack, right? As you could probably have predicted, I did end up with all base this time around. 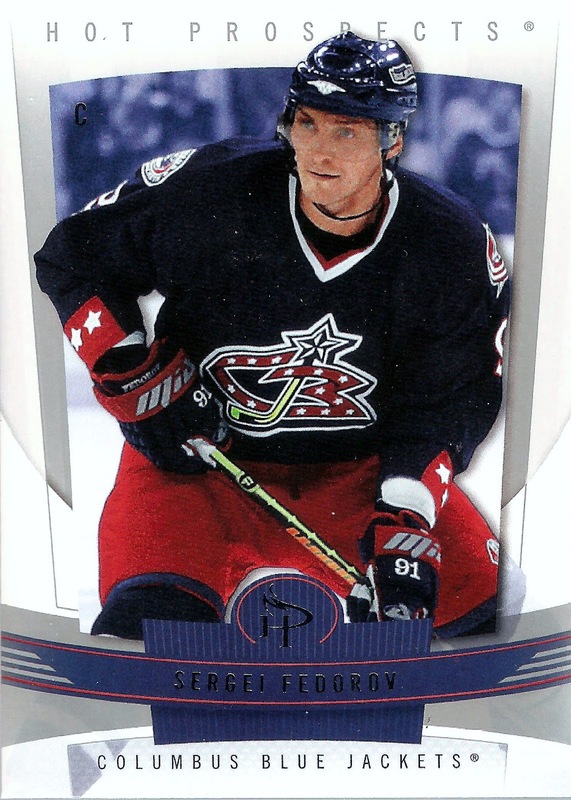 Up first we have this one featuring former Red Wing Sergei Fedorov, although here he is pictured during his time with the Blue Jackets. 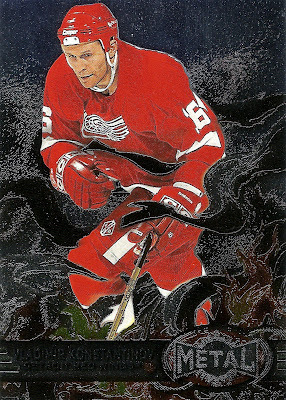 I will always remember him as part of the three Red Wings Stanley Cup teams between 1997 and 2002. He played a big part in all three of those championship runs. 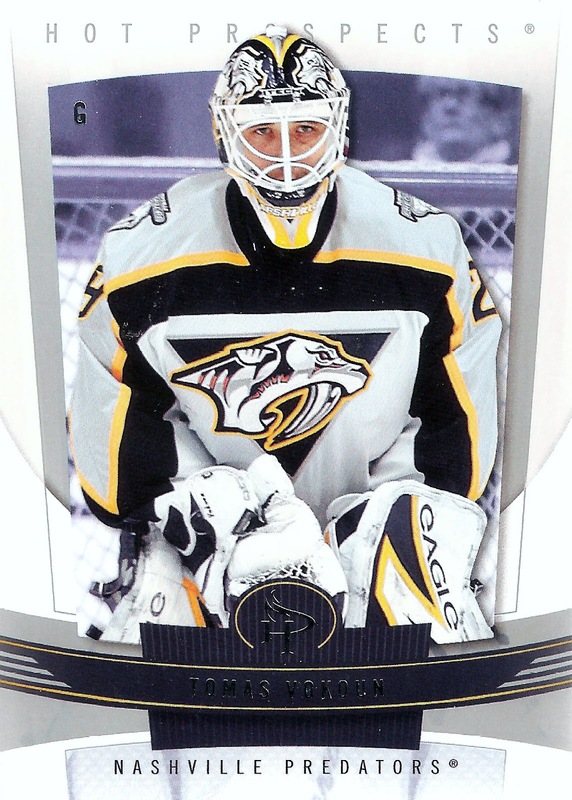 The next one was this Tomas Vokoun from his days with the Nashville Predators. One thing I will say about this card is that I love those old Predators jerseys. I had a white one as a kid and loved to wear it. Now I only have the dark blue, but still wear it out once is a while. 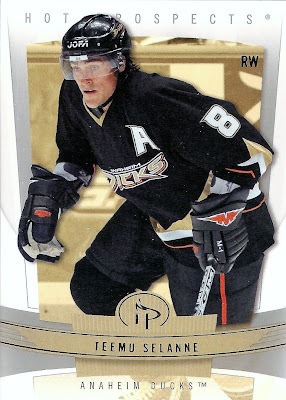 Next we have Teemu Selanne pictured with the Anaheim Ducks. On the topic of jerseys, I think this incarnation of the Ducks uniform is one of the worst in the history of the league. I mean come on, they couldn't have just gone with the giant "D" from the start? 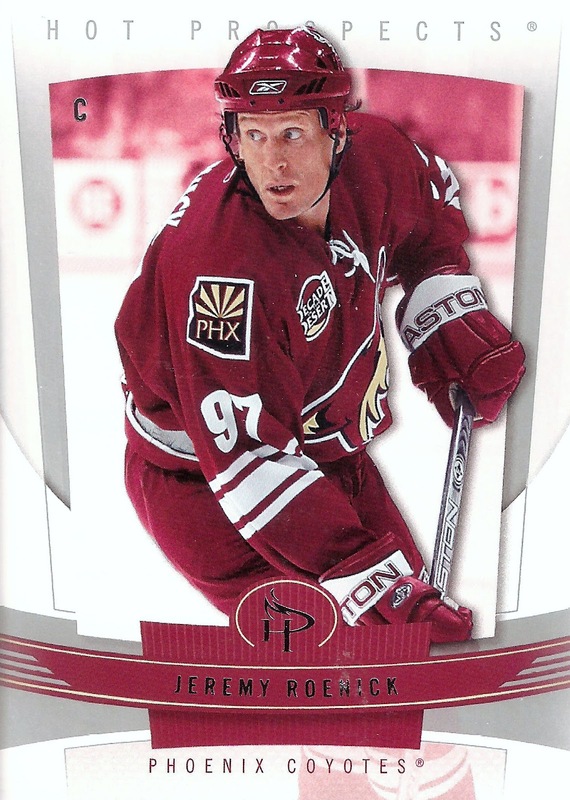 Last we have former Coyote Jeremy Roenick. It's weird seeing him in the redesigned Coyotes jerseys, as I will always remember him from his days with Phoenix in the late 90's, especially from the playoff series between Phoenix and Detroit during the Wings' 98 Cup run. That's it, just four pretty nice looking, and feeling, base cards. I have to say the design is not all that bad. I really like the little stylized "HP" logo in the center. The way the background of the image is tinted to match the team color is also pretty cool. 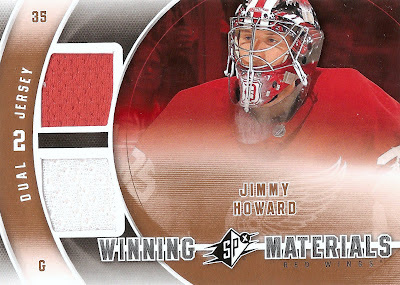 Lately I've hit a bit of a lull when it comes to buying cards for my Jimmy Howard collection. I don't know what it is, but for some reason I just feel the need to focus more on my set projects at the moment. That's ok though and that's exactly why I have more than one project going. If I get bored with one, I just move onto another until I get bored with that one and the cycle repeats itself. My latest Howard pickup didn't really even come from my own efforts, as it was pulled from a box of SPx by Sal over at Puck Junk a while back. I inquired about making a trade for the card and we came to an agreement, and now the card is mine. Thanks Sal! The best thing about this card is that it has both a red and a white jersey piece on the front. I don't really care if that is any more or less rare than all white or all red, I just thing it looks better having both team colors represented. If only I could say the entire design of the card looked great, then this would be an awesome card. Not trying to complain about UD here, but did they really have to cut off the tops of the player's heads on these cards as well as all the base cards? It just looks awkward, right? Other than that, I just don't like the massive amount of dead space above the "Winning Materials" text and SPx logo. Oh well, what can you do, they can't make something that pleases everyone, am I right? This one brings my Jimmy Howard collection total to 124. Not a bad start to a PC, but I have to admit, it's getting to be a bit overwhelming with all the cards he has coming out these days. I'm not saying I want to give up on the project or anything, at least not yet, but I will probably back off a bit when it comes to pursuing these cards and just pick them up as it makes sense here on out. Finally, the weekend has arrived and I can relax after one heck of a busy week at work. Sometimes I wonder why I got into engineering in the first place. Anyway, since I didn't have any time to get to this during one of my lunch breaks, I thought I would get it out of the way now before doing any of my remaining pack break posts. 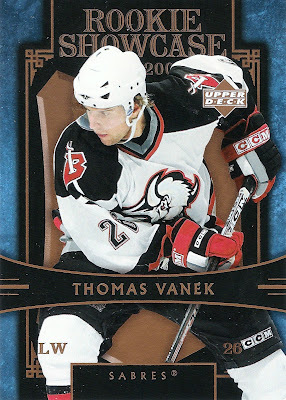 This Thomas Vanek is the third card I've been able to pick up for this set lately. The other two were Ryan Suter and Jeff Carter. So far that's a pretty good start as these are three of the better players from the 2005-06 rookie class. In case you were wondering, I was able to get this one for just under $3 delivered. Not bad considering it's a short printed rookie set from six years ago now. All three have actually been right around $3 which is definitely a good thing for my wallet. This leaves me with 33 more to complete the set. And like I said previously, the only one I am really worried about picking up is the Crosby, as most of those are listed around $50. Lately I feel like I've been focusing less on my Jimmy Howard collection and more on my MVP Stanley Cup Edition master set project, specifically the Super Script parallels. These suckers are hard to track down and I've still got close to 200 left to finish the set. Knowing that these things are so rare, I probably get the biggest thrill when I see one of these pop up on eBay compared to my other PC projects. This Jason Woolley numbered 19/25 is the 27th I've picked up now. It cost me a little bit more than I was hoping to pay, but sometimes you have to do whatever it takes to land a card for your collection. In case you're wondering, I was able to snag it for $18 delivered. 2012 has been a good year so far for this set, as this is the 5th one I've gotten, and it's only June. All of 2011 only brought me eight, so maybe this is a good sign that I will surpass that number this year. Definitely keeping my fingers crosses that more of these pop up over the summer and into the fall. This one also adds another country to the list of places where cards for this set have come from: Sweden. That's a pretty long way for this card to travel, but it made it into my hands safe and sound thanks to another successful eBay transaction. Since I don't have any mailday posts ready at the moment, I figured I would continue to chip away at the 12 pack breaks posts I need to get to from my Target value box. Today's post is a bit of a change from the previous ones, as it's the first post-lockout era pack I've gotten to. It's a pack of 2006-07 Bee Hive as you probably deduced from the title of the post and the wrapper below. This is a name that I never really understood for a hockey card set. Can someone please explain the origins of this name for me? It would be greatly appreciated. 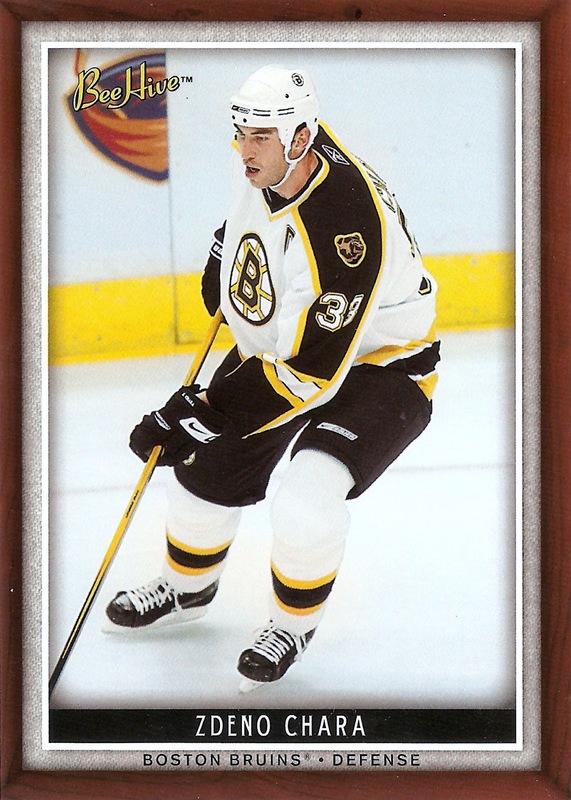 First we have this on featuring Zdeno Chara of the Boston Bruins.The 6'9" defenseman began his career with the Islanders back in 1997-98. He made it to Ottawa through the trade that sent Alexei Yashin to New York. 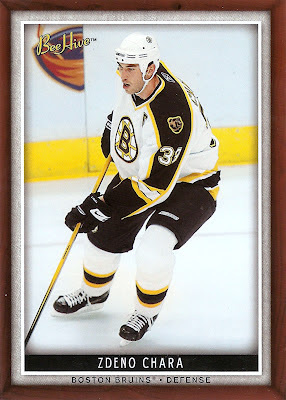 He then signed as a free agent with the Bruins and has been there since. 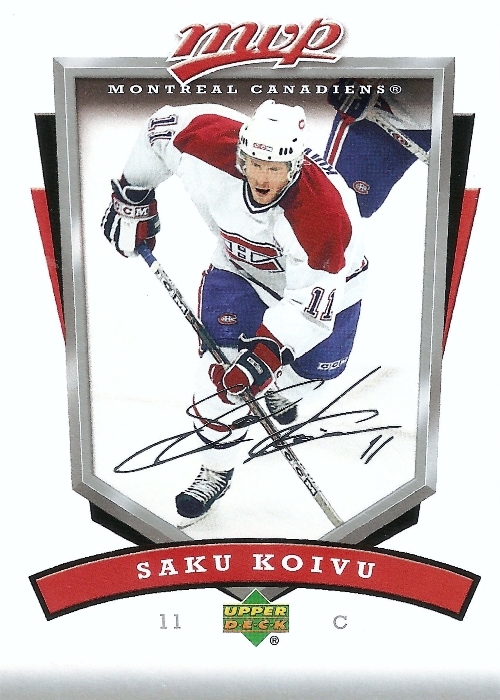 Then there was this one featuring Saku Koivu of the Montreal Canadiens.Koivu began his career with the Canadiens by playing a full 82 games in 1995-96. 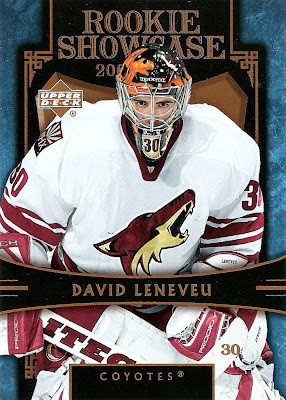 After twelve more seasons there, he would move on and sign with the Anaheim Ducks for the 2009-10 season. 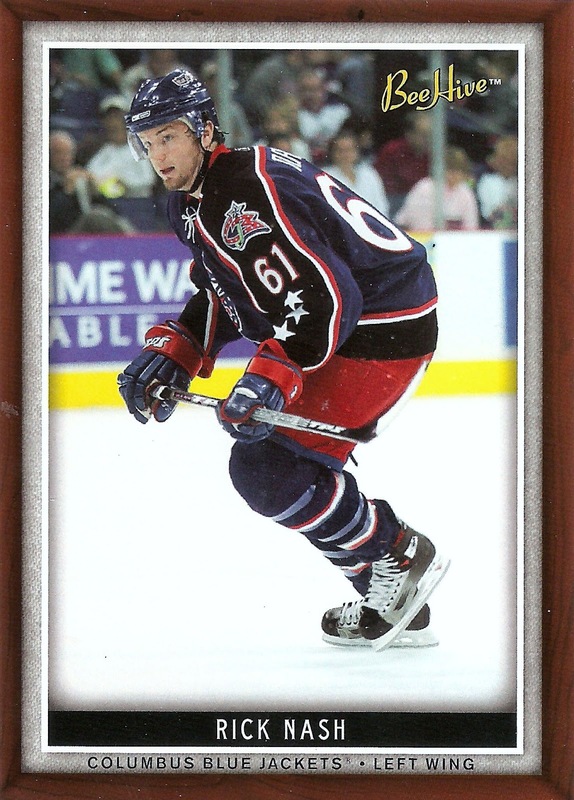 Third was this one featuring Rick Nash of the Columbus Blue Jackets. Nash is the face of the Columbus Blue Jackets and has been there ever since he was drafted first overall back in 2002. In nine seasons, Nash has racked up 289 goals and 547 points in 647 games. 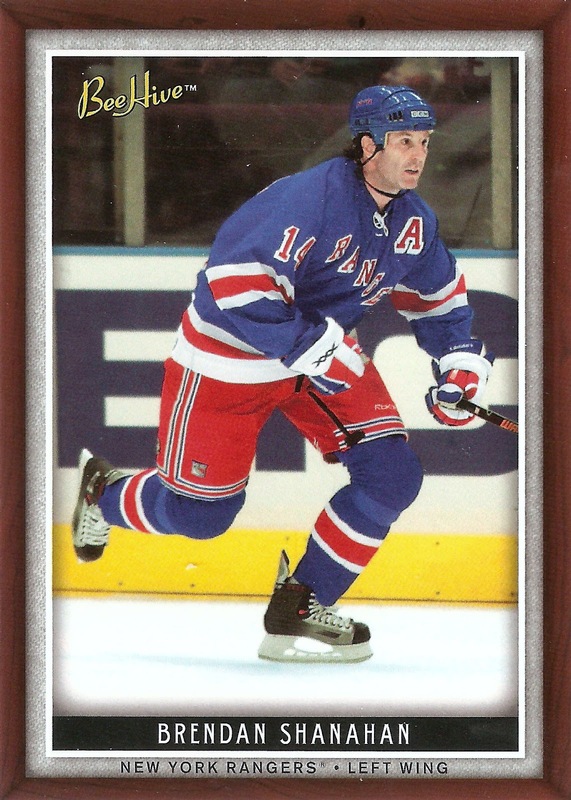 Finally, there was this one featuring Brendan Shanahan of the New York Rangers. I will always remember him from his days with the Wings and the three Cup teams he was a part of in 1997, 1998, and 2002. On a side note, did you know he made an appearance in the movie "Me, Myself, and Irene" with Jim Carey? All in all, not a bad pack player wise. I didn't hit anything other than base cards, which is ok because I don't think I have many cards from this set. I definitely like the simple design these cards have. Nothing too flashy, just the necessities. Time to get back into the swing of things with another pack break post. This will be the third of the twelve packs that came from the extreme value box from Target. This time we have another pack of Pro Set to go along with the last break I posted. This is another one of those sets I remember having hundreds of, if not thousands, when I was a kid. Back then Pro Set was one of the few options available unlike the surplus of products we have each and every year in today's world. Since Windows sorted everything in my scans folder by name, the cards below are listed in alphabetical order by the players last name, which is how I label the scans for most of my pack breaks. 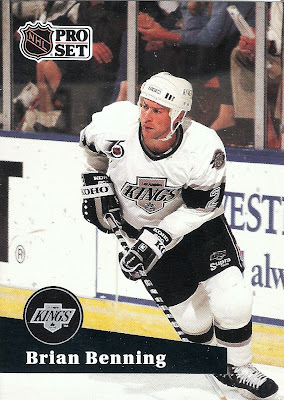 The first was this one of Brian Benning with the Los Angeles Kings. 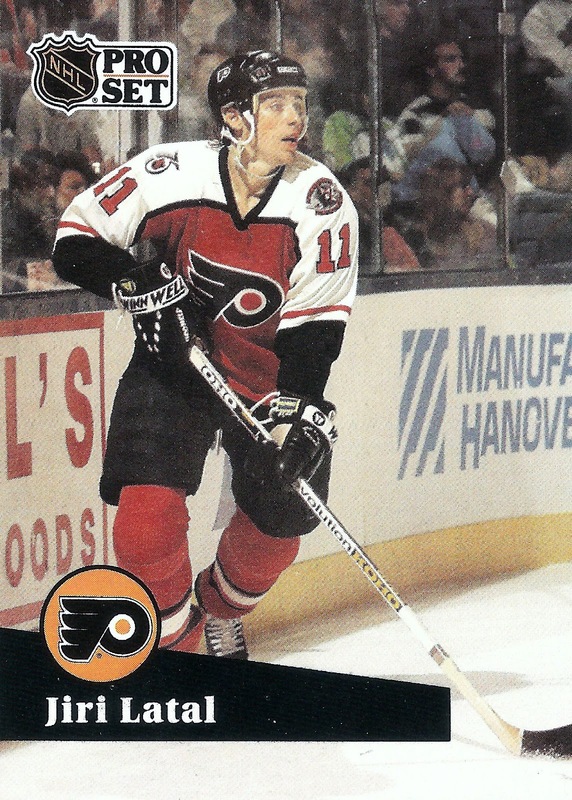 Next we have Dave Brown of the Philadelphia Flyers. Dave started with the Flyers with two games in 1982-83 and went on to play ten seasons there, with a few seasons in Edmonton thrown in there. 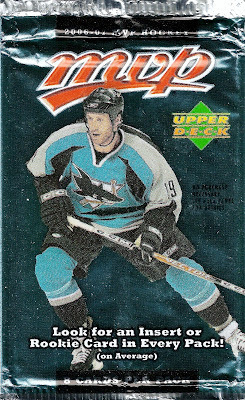 He finished his career with the Sharks in 1995-96. Then there was Mike Craig of the Minnesota North Stars. 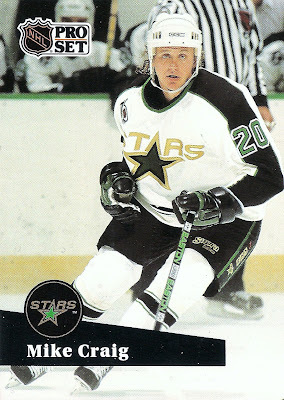 Craig played three seasons with the North Stars from 1990-93. His last season in the NHL was two games with San Jose in 2001-02. After that he went onto play several seasons in the Austrian hockey league. Time for the first rookie of the bunch, Louie DeBrusk of the Edmonton Oilers. DeBrusk appeared in 25 games for the Oilers during his rookie season in 1991-92. He went on to play over 400 games between Edmonton, Tampa, Phoenix and Chicago between 1992 and 2003. Then we have former Montreal Canadien Todd Ewen. 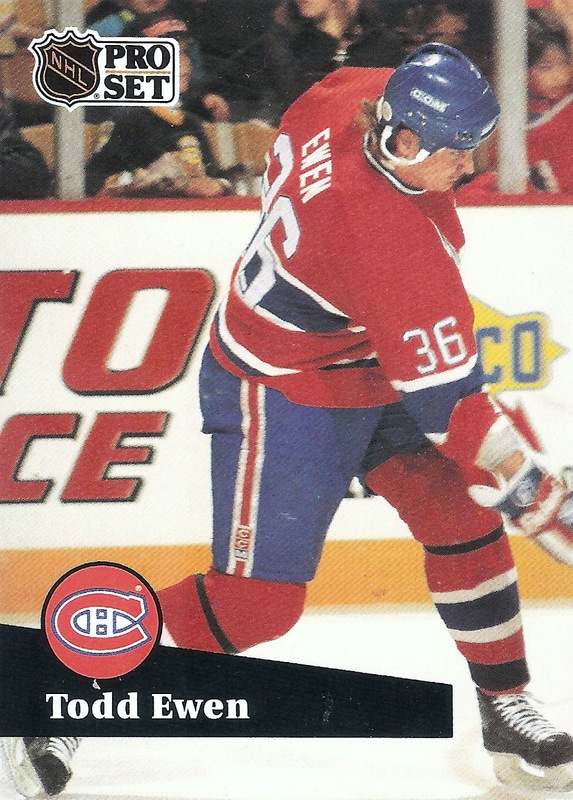 He was originally drafted by St. Louis and played four seasons there before suiting up for the Canadiens in 1989. 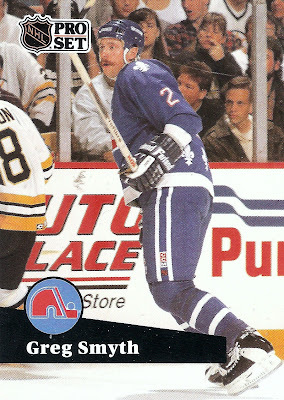 He went on to play three more seasons in Montreal followed by three in Anaheim and one in San Jose. Next we have one of the "Captain" cards featuring former Quebec Nordique Mike Hough. 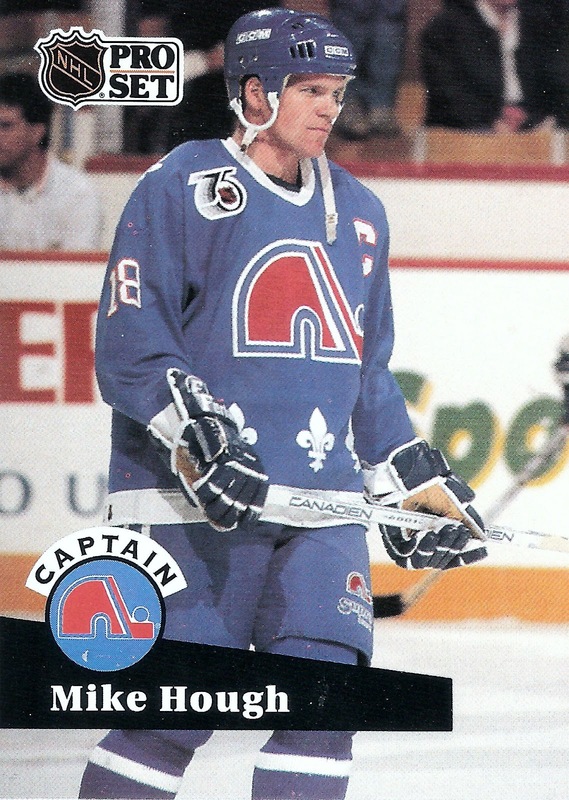 1986-87 was Hough's rookie season with the Nordiques, after which he played six more seasons in Quebec followed by four seasons in Florida and two seasons on Long Island. 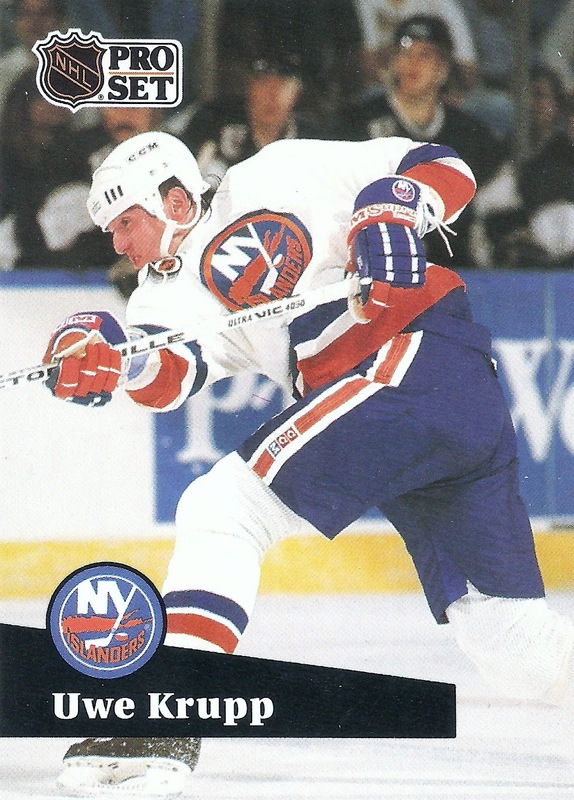 Then there was former Islander Uwe Krupp, who is probably best known for scoring the Cup clinching goal for the Colorado Avalanche in 1996. He only spent three seasons with New York before four with Quebec/Colorado, two in Detroit, and one with Atlanta. 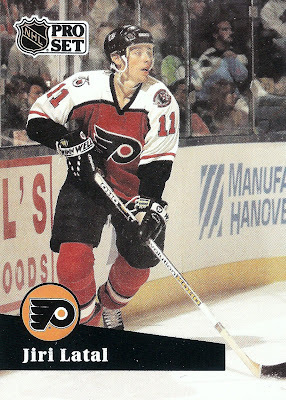 Next we have former Philadelphia Flyer Jiri Latal. He spent most of his career in his native Czech Republic, but played four seasons across the pond in. 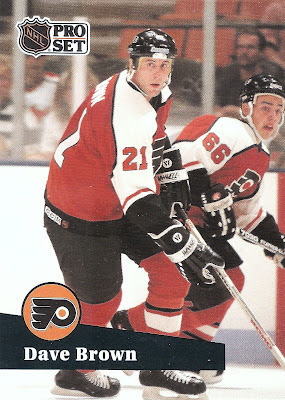 One of those was with the Hershey Bears of the AHL and the other three were all with the Flyers. 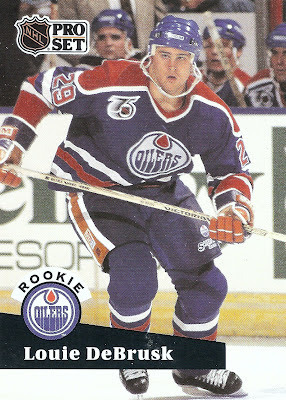 Then there was Dave Manson of the Edmonton Oilers. 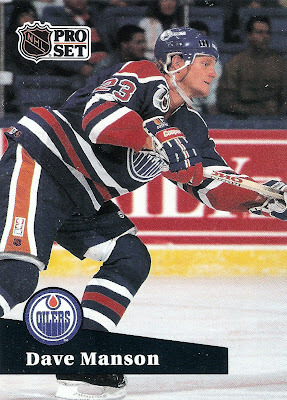 Manson began his NHL career with the Blackhawks in 1986-87 before coming to the Oilers for the 1991-92 season. He would play there for three seasons before bouncing around the league through 2001-02. 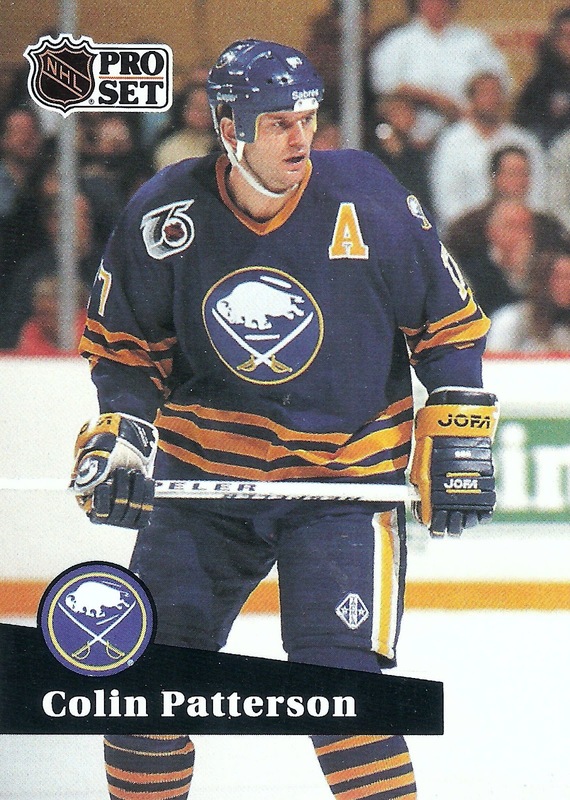 The next one was this Colin Patterson picturing him with the Buffalo Sabres. 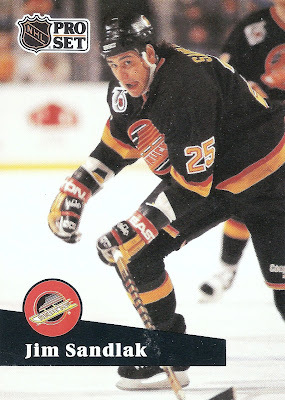 This was one of only two teams he would play for during his NHL career, the other being the Calgary Flames. Eight seasons were with the Flames and two were with the Sabres. This was the only oddball in the pack, a "Play Smart" card featuring Kelly Miller of the Washington Capitals. The back of the card has some quotes from Miller talking about how important things like friends and family are, as well as giving back to your community. 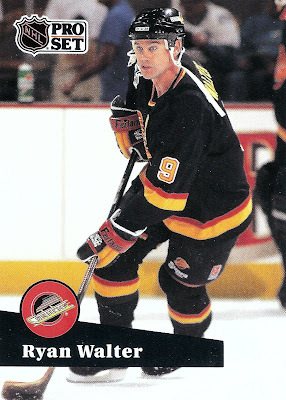 Then there was this one featuring former Vancouver Canuck Jim Sandlak, who I've never heard of before seeing this card. Sandlak played nine seasons between 1985 and 1996 with Vancouver as well as two seasons with the Hartford Whalers from 1992-94. 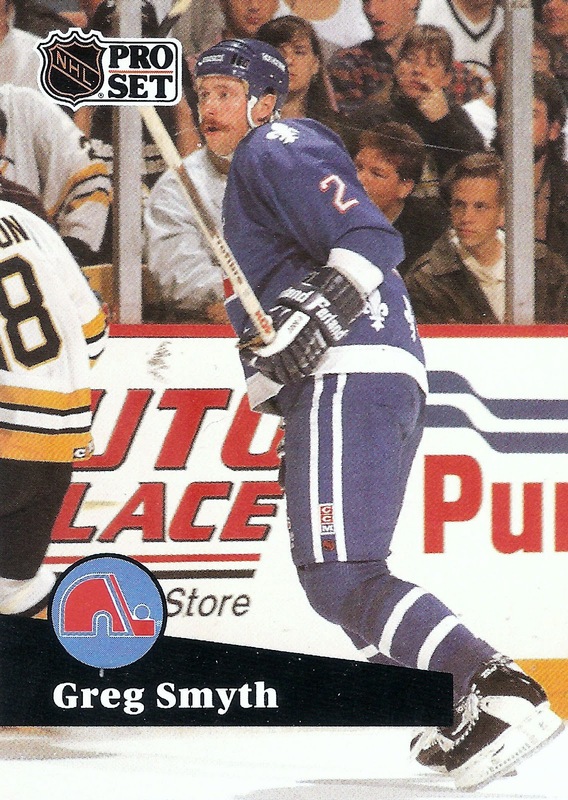 The next one was this one featuring Greg Smyth of the Quebec Nordiques. Smyth began his career with the Flyers back in 1986-87, playing in just one game. He went on to play nine more seasons between Philadelphia, Quebec, Calgary, Florida, Toronto, and Chicago. 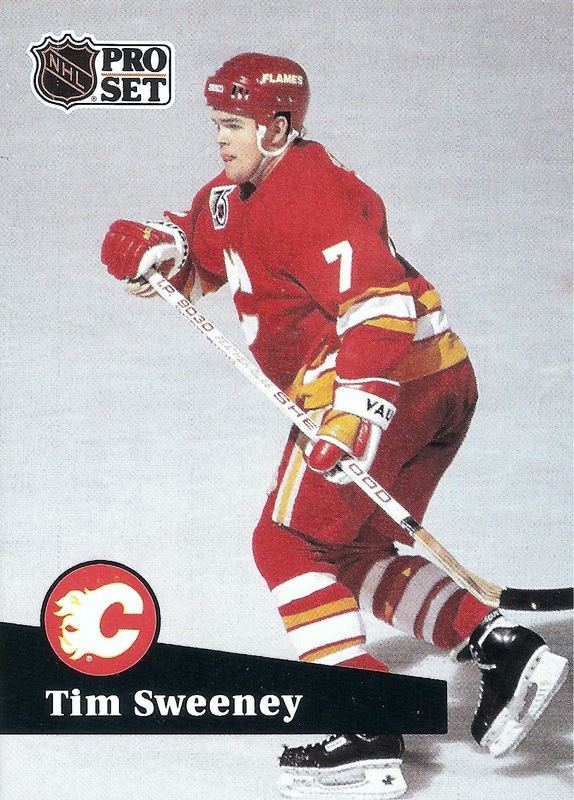 Then there was this Tim Sweeney picturing him with the Calgary Flames. Sweeney began his NHL career with the Flames in 1990-91 playing in 42 games collecting 16 points. He would go on to play six more NHL seasons between Boston, Anaheim, and the New York Rangers. Last but not least, we have this one featuring Ryan Walter of the Vancouver Canucks. 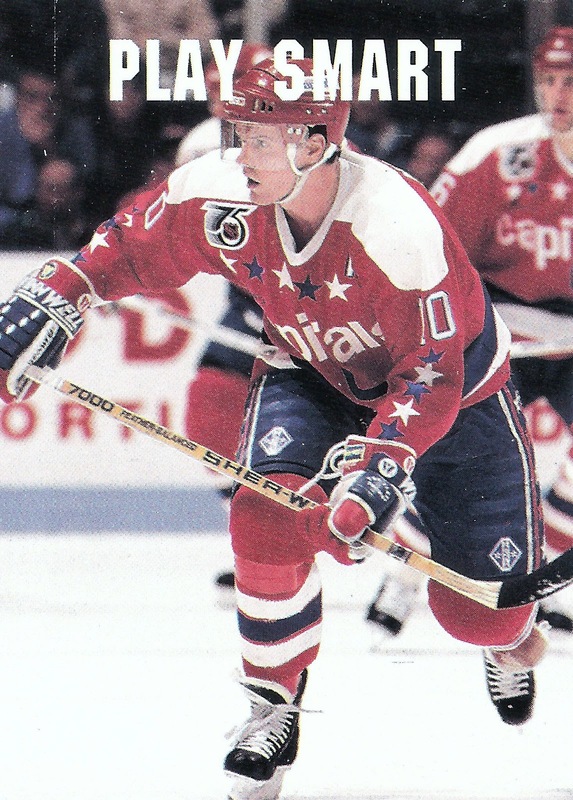 Walter began his career with the Capitals in 1978-79 and played 15 seasons between Washington, Montreal, and Vancouver. Bet you didn't know he played the referee between the US and USSR in the movie "Miracle," at least he did according to Wikipedia. That's it for this pack, and this time all of the cards were included as I didn't get anything worthy of one of my side projects. That said, off to the monster boxes these go, as there were no Red Wings for my PC either. I probably have this entire set at least once if not twice over, but I will probably never know because I'm too lazy to try and put something like that together with all the other projects I'm working on. 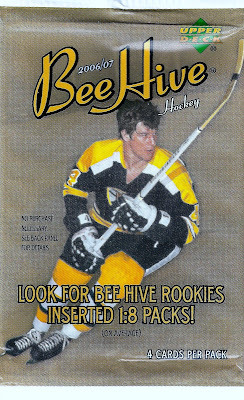 Recently one of my favorite hockey card blogs, Puck Junk, held a contest to coincide with it's relaunch. 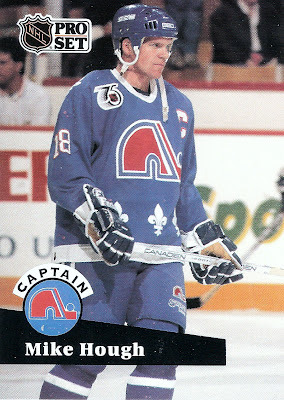 The winner of the contest received a nice 1987-88 Topps Patrick Roy. While I wasn't the lucky one to win that particular card, I did end up with a consolation prize that was even better than the Roy as far as I'm concerned. I've actually never even seen this card before, so that makes it that much better, plus it's another one for my ever growing Red Wings collection. It's the third Wing I have from the set, leaving me with just a few more to complete the team set. This one brings me to 67/200 for the base set. Just want to say thanks Sal for putting on a great contest and for sending out the consolation prizes. Time for another post to break up the 12 pack breaks I need to get to from the value box I bought at Target a few weeks back. 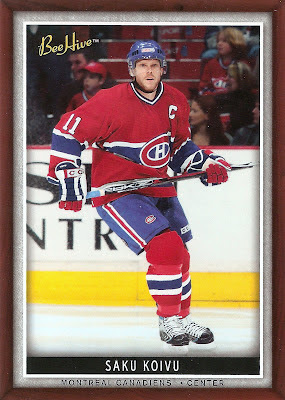 This time it's another mailday post, for another one of my set projects, 2005-06 Upper Deck Hockey and Rookie Showcase. 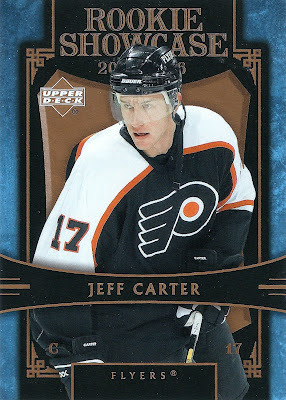 This one features none other than the OT hero from game two of the 2012 Stanley Cup Finals, former Philadelphia Flyer Jeff Carter. It's a pretty sharp looking card if you ask me. This is only the second one I've picked up for the set project specifically, as I do have a third in the Howard already, but that's for the player collection, so I still need another one for the set. It should be a fun one to build though, until I get to the point where Crosby is the only one left. I've see that one listed with BIN's of more than $50 lately. Anyway, I was lucky enough to get this one for just $0.99 on eBay with a few buck for shipping, pretty good deal don't you think? I've officially got 2/36 for the set now.